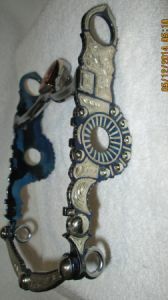 This is a Santa Barbara western show horse bit made with GERMAN SILVER inlay instead of silver. It is made of steel with a Black finish. This particular one has MP-40 (San Joaquin MP) which is a high port mouthpiece with copper roller & hood and some tongue relief). MP width is 5 1/4" sweet iron (which horses love), normal angle, and bit ends with a slobber bar.